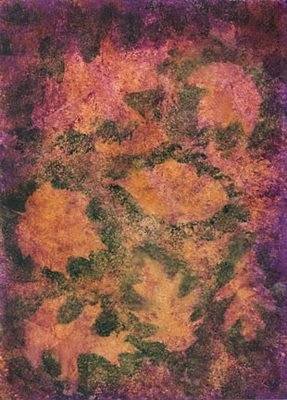 Here are some of my favorite methods for creating background papers to use in mixed media art, both physical and digital. 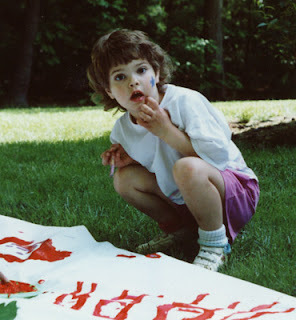 Don't forget to check the Fabric painting page too...many of those techniques can also be used on paper. Love using jewelry making components in interesting ways? Lisa does too and is sharing a simple, but fun bracelet made on the beach! Beads? Free beads? Who doesn't like a good bead giveaway? 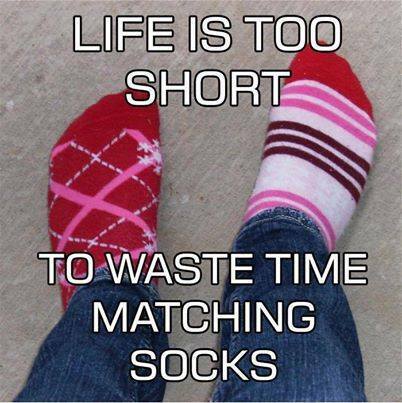 Cyndi's got one going on! When is it okay to spend a bunch of money on super fancy yarn? I imagine that miniature vials will always appeal to those of us who like unique and unusual beads. This week I featured them in a necklace. 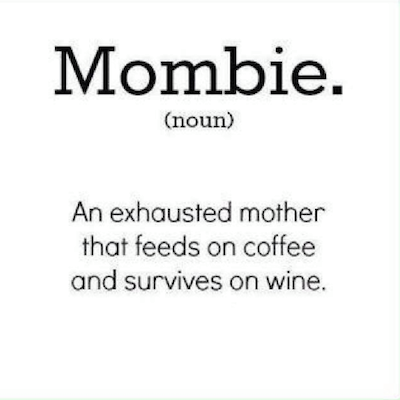 Mother's Day is coming up May 11th. Now's the time to start thinking about what you'll create for Mom or Grandma to show her your love. Cherie makes some glass mushrooms for the garden. Today's post features a classic one pour resin project! 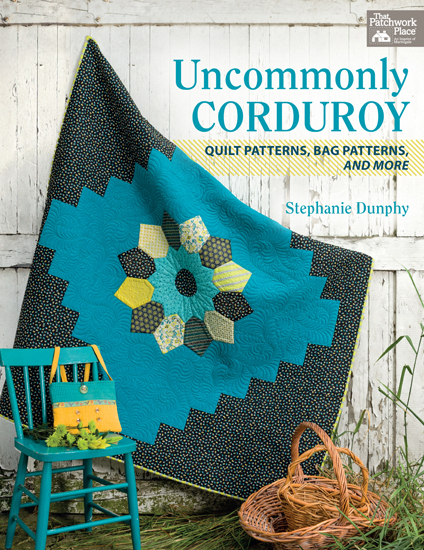 Come and see the lovely online book which Rita Toltec made of the recent Blog Hop she hosted which included fifty designers: THE COLOR OF DREAMS ! It is such a beautiful book! So dreamy! 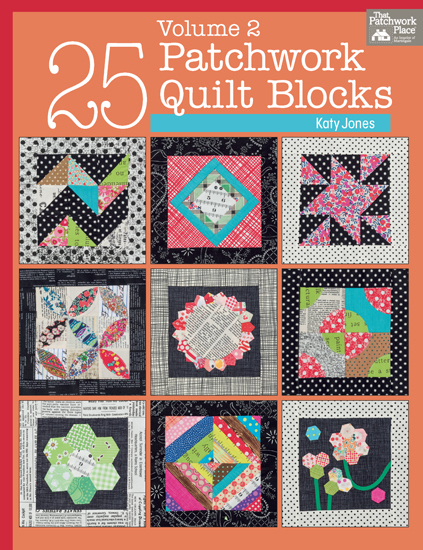 Katy Jones presents 25 six-inch blocks that feature a range of styles, from traditional to brand new in 25 Patchwork Quilt Blocks (volume 2) for Martingale publishers. All the basics are spelled out in great detail, making this an excellent beginner book: you'll learn paper piecing, and applique (both by hand and by machine), if you're not already familiar with these techniques. Even though the bulk of the book concentrates on just presenting the blocks, there are four projects included just to give you some ideas on how to use them! Here's a round-up of many of the fabric techniques we've covered here. 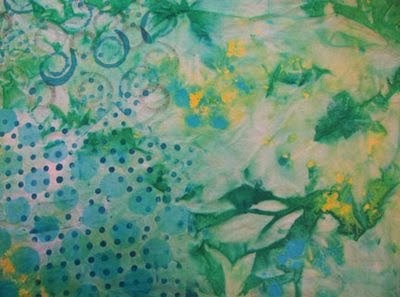 Many of the techniques covered in Background papers, although they were designed with paper arts in mind, can be used for fabric painting too, so don't forget to check them out as well! Quick and easy little crocheted bead bracelets have been around for a long time...but how long has it been since you've made one? 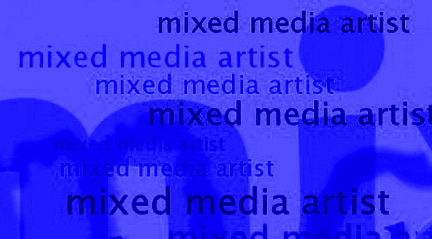 Here is a compilation of all the image transfer tutorials on Mixed Media Artist. 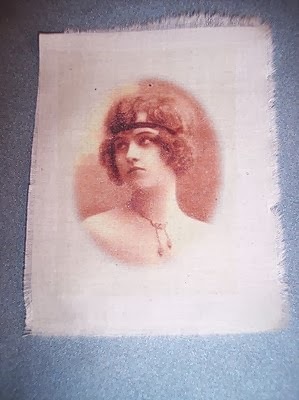 There are even more methods now, especially since there are several forms of specialty papers that will create a perfect (or almost perfect) transfer. However, the beauty of transfers in my eyes are that they are somewhat unpredictable and imperfect, so these are the methods that I stick with! Cyndi shares a tutorial for a pair of chain and pearl earrings that have now become her favorites! 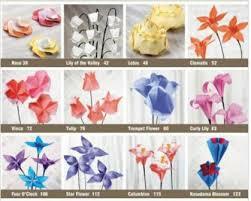 Do you enjoy origami and other forms of paper folding arts? 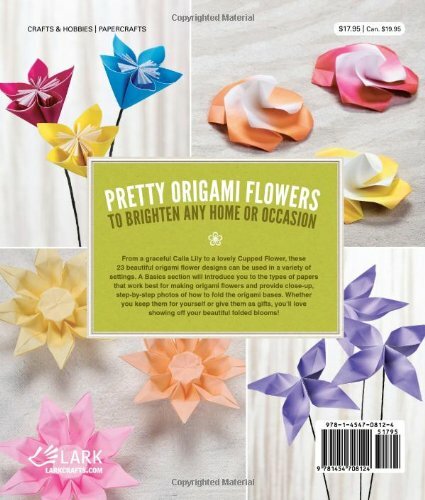 If so, then you are likely to really enjoy the new release by Lark Books, Beautiful Origami Flowers, written by Anca Oprea. 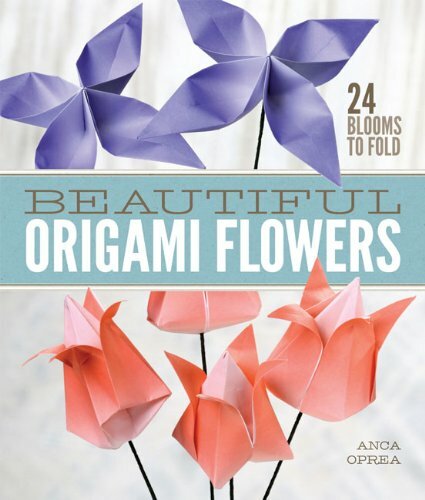 If you haven't played around much with origami, never fear: there is an excellent basics section which will get you started. Anca teaches the basic folds first, and if you work your way through this section, you will be ready to make any of the following projects. The flowers are so much fun. 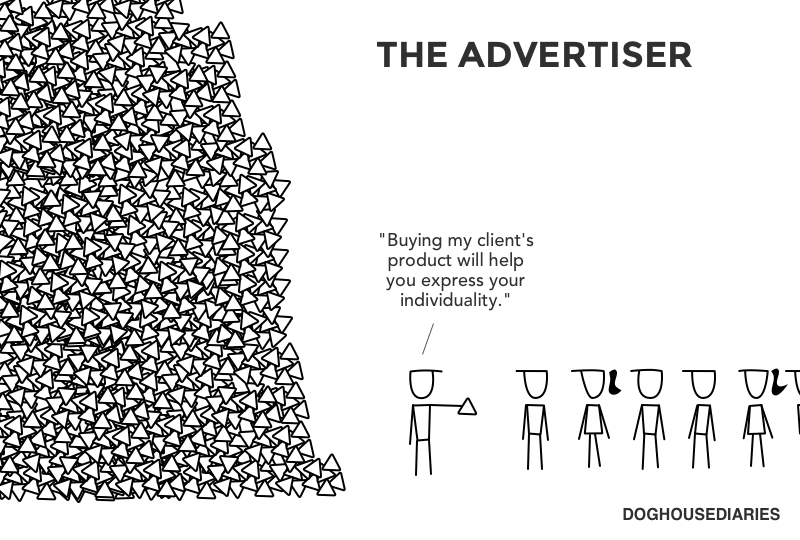 Some of them are quite realistic, and others are much more fanciful and imaginative. My favorite is the common old every day Day Lily, and I also like the Crane Flower, although I don't think I'd have the patience to complete even one! 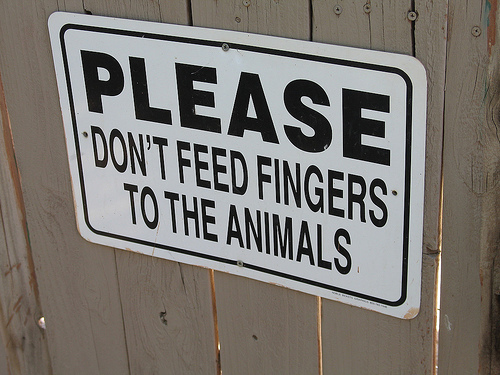 I am gifting this book to one of my friends, who happens to only have the use of one hand. Despite this, she makes amazingly wonderful origami designs all the time. 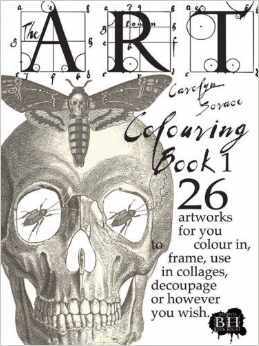 I am hoping to see her make an entire bouquet inspired by this beautiful book! Last week, I finished up with all the weaving and embellishing that I wanted to do on my quilt, so now it's time to do the quilting! 9. 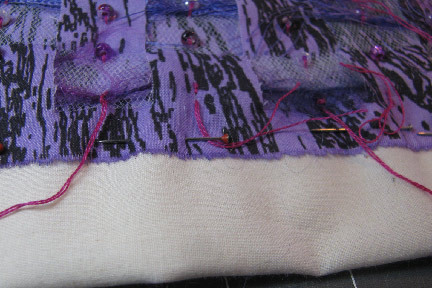 Pin each slit to the piece of batting and to a piece of backing fabric, even larger than the batting. In this case, the backing fabric is cut 1 1/2 inch larger on each side than the batting. 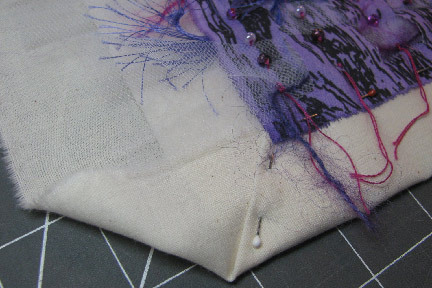 Place a row of pins all around the outside of the woven top, 1/2 inch from the edge to mark the area available for quilting. 10. 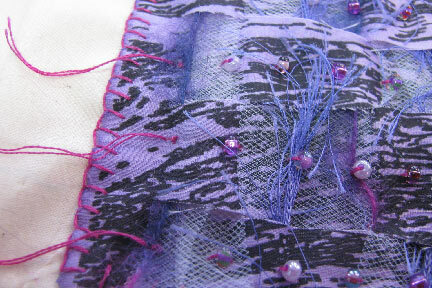 Use perle cotton and beads to quilt up each strip through all the layers, including the backing. Tie off the thread ends on the top and leave them showing. 11. 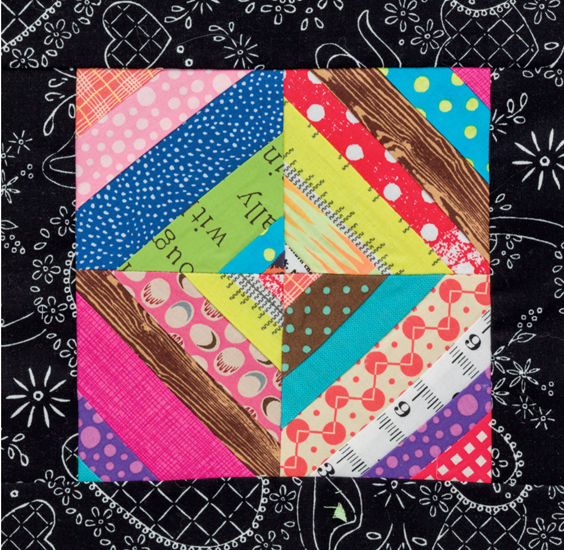 Using the wrap and tuck method, miter the corners of the quilt. 12. 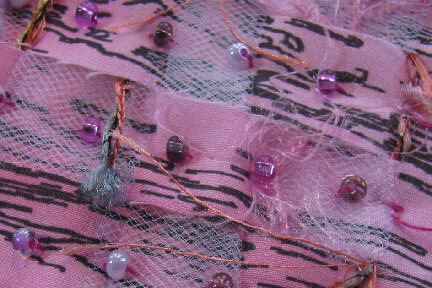 Wrap and tuck the backing under the outer edges of the top, pinning in place. 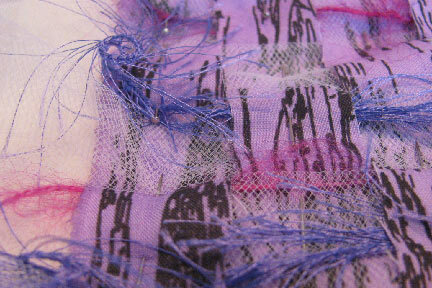 The edges will need to be ironed, as you can see! 13. 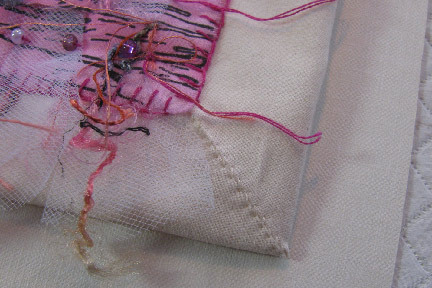 Use a blanket stitch to finish off the edges of the binding. 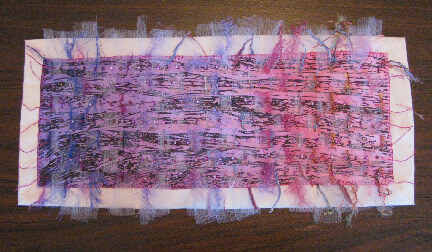 As much as possible, I stitch this edging through all the layers, including the backing fabric. 14. Whip stitch the mitered corners. Check out March's Challenge Monthly Recap - lots of beautiful jewellery made by some of our lovely readers! Using a mixture of bead stitching techniques, Cyndi finished a whopping big turquoise necklace that still needs a name! I have a new kumihimo experiment - a rat tail plus sari yarn braid. This week I have two special posts showing you how to make truly one of a kind candle holders with EasyCast. 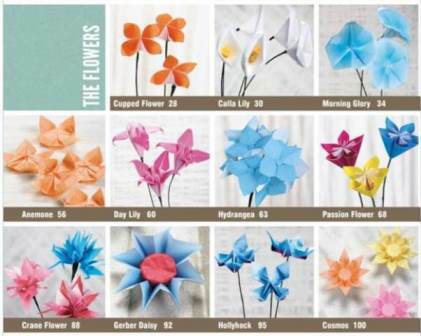 Looking for Easter and Spring crafts? Find directions for everything from unique Easter eggs to holiday table décor and jewelry at The Artful Crafter. Andrew shares the latest creations made for the March selection of the Inspired by Reading Book Club, "An Irish Country Doctor" by Patrick Taylor. Tammy shows off an owl necklace design she has been plotting and planning for some time. 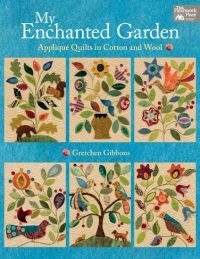 Among the new titles by Martingale is one that immediately appealed to me: My Enchanted Garden by award-winning quilt designer Gretchen Gibbons. 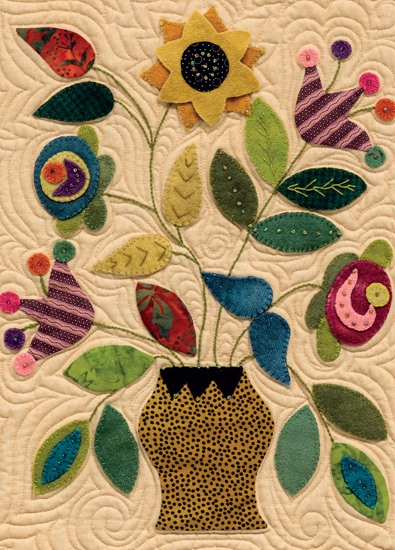 The bulk of the book is dedicated to helping you create a nine-block quilt featuring the happy birds, animals, trees, and flowers that are her trademark. This is followed by eight smaller projects that show you additional ways to combine the plant and animal motifs. Getchen works in both wool and cotton applique, and she goes over all the techniques for working with these materials prior to starting the quilt instructions. She covers felting your wool, doing both needle-turned and fused applique with your cottons, adding embroidery stitches, and basic quilt construction. 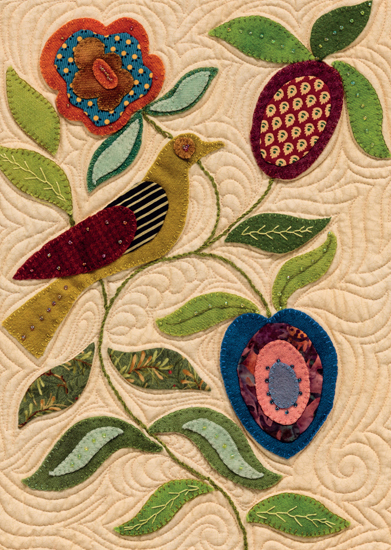 The image shown above is called "Zen Bird," and he is part of the first project, the nine-block "My Enchanted Garden" quilt. 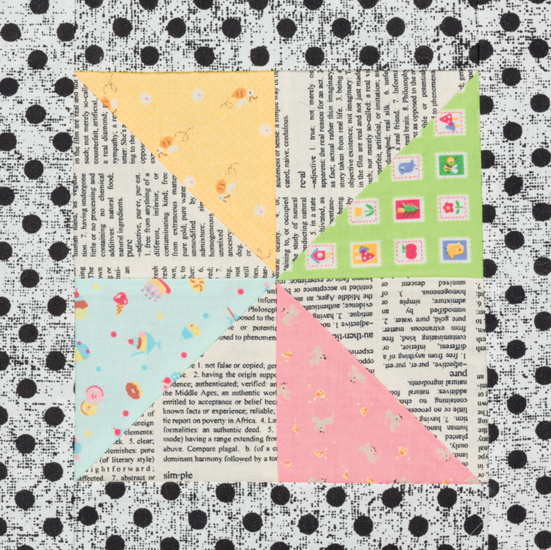 The block shown below is from this same quilt, and is called "Happy Bouquet." 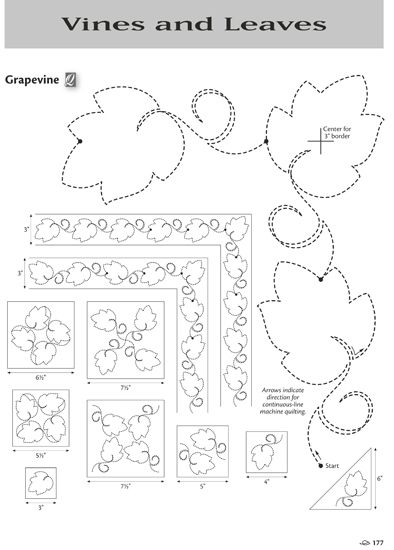 Each block has a pattern, which includes an embroidery guide, a fabric list and measurements, and directions for making the block. 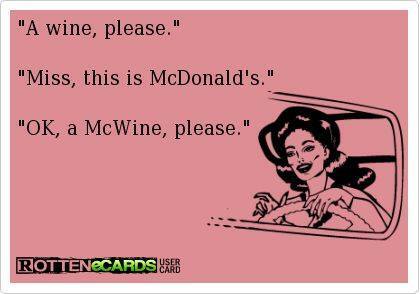 This is followed by assembly instructions. 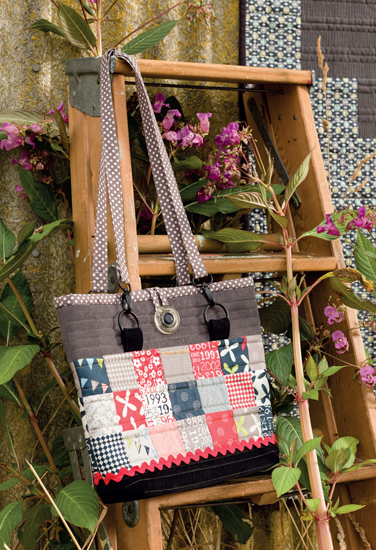 The additional projects walk you through making smaller quilts, a pillow, and a purse. 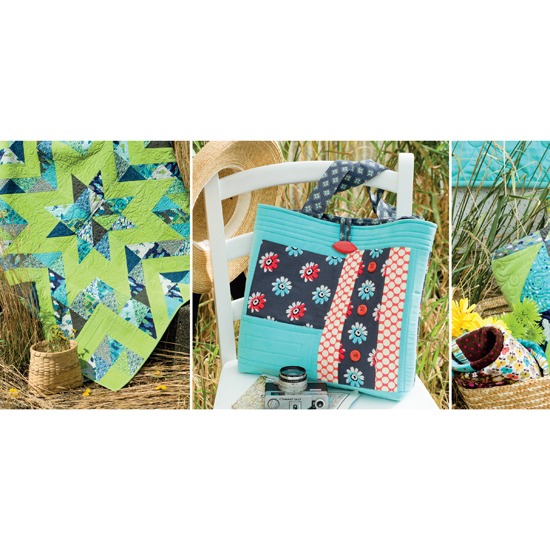 Each of these projects has the same attention to details as the nine-block quilt, with easy to follow step-by-step instructions, patterns, and fabric lists. 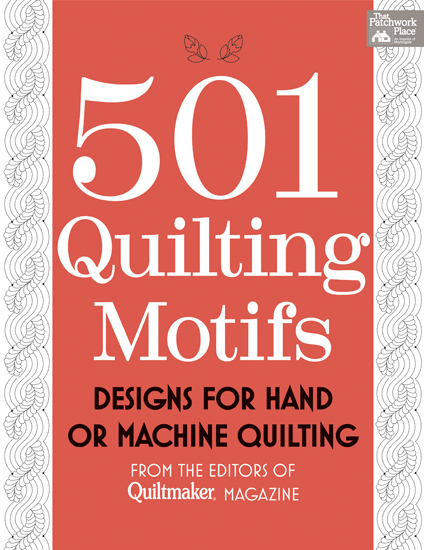 If you feel that you would like to try this type of applique quilting and haven't done it before, this may just be a good first book for you!